Silvia Rizzo and Donnerbube 2 half-pass at the Chi Al Shaqab festival’s CDI4* in Doha, Qatar. Photos by Stefano Grasso. Wellington, FL, April 12, 2013 – Dressage superstar Donnerbube 2’s FEI passport was so stuffed with stamps that his rider, Silvia Rizzo, had to procure a new passport for the globe-trotting horse. Rizzo and her Oldenburg stallion, nicknamed “Bubi,” have been delighting dressage audiences around the world. Most recently, in late March, the duo returned from a successful outing at the Chi Al Shaqab festival’s CDI4* in Doha, Qatar. 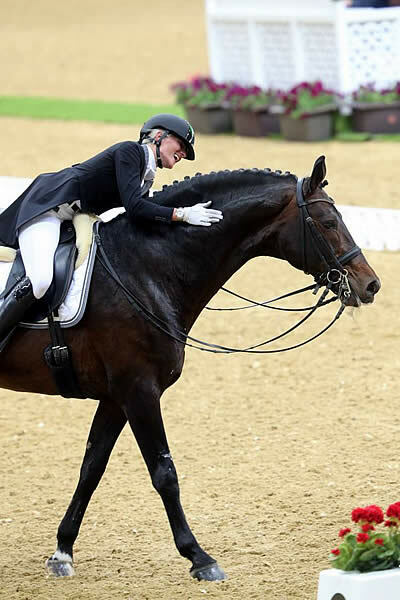 The invitation-only event featured accomplished dressage riders from around the world and took place alongside top-class endurance and show jumping competitions. Rizzo appreciated the show organizers’ generosity: travel expenses for horses and riders were covered as part of the invitation. She enjoyed her stay in a five-star hotel and spent time visiting the city and local attractions. The Doha CDI came not long after the pair completed a one-month tour in South Florida in February. While in Florida, Rizzo, who rides for Italy but lives in Germany, visited Walt Disney World and had her photo taken with Mickey Mouse, but there just wasn’t room in the car for the horse. Instead, Bubi and Rizzo competed in a busy schedule of shows, including the prestigious World Dressage Masters Palm Beach CDI5*. Before Christmas, the two competed in a World Cup qualifier in Stockholm, Sweden, and in November they went down centerline in a CDI4* in Wien Stadthalle, Austria. Earlier that month, they competed in Lyon, France and in September they traveled to Vienna, Austria, and Wroclaw, Poland. In July, they piaffed in Falsterbo, Sweden, at the CDI5* World Dressage Masters and in February and March they braved the cold in Wroclaw, Poland. And that was just 2012 and the first few months of 2013. Rizzo and her horse are currently 18th on the Western European League World Cup Ranking and second reserve in line to participate in the 2013 Reem Acra World Cup Dressage Finals to be held in Gothenburg, Sweden, at the end of April. The combination’s outstanding results in 2012 and 2013 enabled a giant leap on the 2013 WBFSH Dressage Horse Ranking. Donnerbube is now ranked 49th overall and contributes to the Oldenburg breed’s fifth place on the ranking list. For more information about Silvia Rizzo and her training facility, Hof Marabunta, visit www.hofmarabunta.com.